Just as the Dunluce round put down a marker that was hugely significant for everyone bar the Walker Cup selectors that year and just as he announced his presence on the PGA Tour in 2010, last night's exhibition confirmed in the post-Masters universe that McIlroy is the top dog. His 11-under par effort was his best as a professional and having started the weekend three shots off top spot parred his first two holes before going on to pick up 11 birdies - including nine in 10 holes at one stage - in a second successive blemish-free round to move to 18-under par for the tournament. Despite that, McIlroy's remarkable display left him with a four-shot lead heading into the final day, with Webb Simpson his nearest challenger after the local hope carded a 68. American Robert Streb, who led after the first round and was joint-top with Simpson at the halfway stage, is a further three shots back in third place. 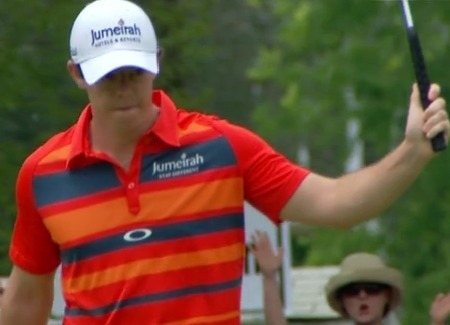 McIlroy told Sky Sports of his round: "It was incredible, it was nice just to get on a run like that. I felt like every shot I looked at, I was comfortable over it and I really putted well today, that was the thing that pleased me most. "I rolled the ball really, really nicely, and I don't think I've rolled it like that in quite a while, so it was nice to see a lot of putts drop. And to break my own course record here is pretty nice." The four-time major winner, who felt he played too conservatively in the second round and felt he was rewarded for going for more pins today, is now clear favourite to become the first two-time winner of the event. 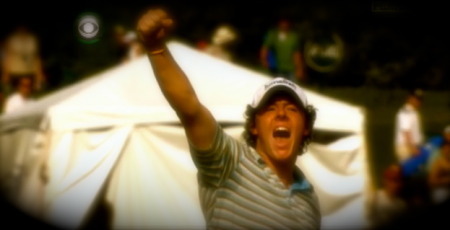 He is also on course to smash the existing overall tournament final record of 16 under, set by Anthony Kim in 2008. And McIlroy insists he has no intention of letting up on the final day. He added of his hopes for Sunday: "More of the same would be nice obviously! But just keep it going. Even though I've got a lead there's no reason why I shouldn't go out there and be aggressive and try make as many birdies as I can. "I'm obviously playing well and I feel like this is a course where I can shoot another low score on." In joint fourth place are Brendan Steele (68) and Patrick Rodgers (70) on 10 under, while Phil Mickelson, who shot a 66 on Friday, is back in a group on eight under after a damaging treble-bogey seven on the 18th left him with a 71. Speaking after his round, McIlroy added: "Obviously really happy with how I played today. You know, I said yesterday I needed to be a little, little better with my iron play and I feel like I was. Gave myself plenty of looks for birdies and, you know, I just feel like it's one of these courses that I can get on a roll on. "I feel like the flow of the golf course with some of the short par-4s and the par-5s you can really get some momentum going. So, you know, got it going again today and really nice to break my own course record here. "But, yeah, you know, there was a couple really things that pleased me today, my iron play and then how I putted. I rolled the ball really well which I haven't been doing for the past couple of weeks so to see a lot of putts drop like that was really nice." Asked what part of his game is better now than it was five years ago, he said: "Mentally. You know, I said this yesterday, mentally I'm so much better. I'm at staying patient, not being afraid to go low, not really -- you know, my mindset or my demeanor doesn't change no matter what situation I'm in in a tournament or on the golf course. I think that's the big difference. Five years of experience, five years of being out here, competing, winning Majors, losing Majors, you know, that's the thing that really is the difference between who I am now and who I was five years ago." On when he started thinking of 59, he said: "When I birdied 13. I got to 8-under par. I had two really good chances, I felt like two eagles chances really on 14 and 15. Birdied those so went to 10-under and that meant needed to birdie the last three holes. Made a great birdie on 16 and then, you know, if I could take any shot back today it was that 7-iron on 17. I just bailed out right. "So, I was a little disappointed with not finishing off the way I wanted to but, you know, still a great round. But 59 was in my mind as soon as the putt dropped on 13." Just as he did when he short 61 at Portrush, he enjoyed describing last night's round. "Yeah. I mean it's hard to explain, how to describe. Every shot you look at you visualize it perfectly and you -- it's all a mental thing. It's all -- you're picturing good shots, you're visualizing the lines on putts and you're not getting in your own way. "You're just letting it happen and that's what I said about flow. I feel like there's a great flow to this golf course and it allows to sort of get out of your own way and I've got great memories here and, you know, I feel like I think I probably birdied every hole on this golf course so there's no reason why I shouldn't do it again, but it's a cool feeling. "You never quite know when you're going to get into it or get into the zone or -- but when it happens, you have to realize it and then that's when you just go with it, and I'm lucky enough that I've been in that frame of mind quite a bit so, you know, I know when it's happening and I sort of know how to handle it. "It's not the lowest score I've ever shot but it's -- it's right up there. I shot 61 at Portrush when I was an amateur and that was a good round. Actually had a putt for 59 at home just before the Masters at the Bear's Club, left it short. "But there's been quite a lot of rounds where I've got it going but that was definitely up there today. That's my lowest round on the PGA TOUR and yeah, it's funny that's happened here again. This is a golf course that just sets up really well for me. "I just aimed at the flags today. It's simple as that. I was sort of aiming at a lot of middles of greens and trying to work the ball into the hole. I was taking dead aim a little bit more today. With the putting, just that one little thought that Dave and I talked about at the start of the week. That's really been it." On his putting, which was off at Sawgrass, he added: "I didn't feel like I putted all that well at the Match Play but I holed putts at the right times. I guess that's more just to do with the mental side of it and drawing on some memories from previous matches or situations where you've been in a position and you just need to hole it. "I think having those positive, positive memories and reinforcement always helps." Hoping to win his 11th PGA Tour title today, he said: "It would just feel great to get another win over in the States here before getting on that plane to London on Sunday night, my 3rd victory of the season. "I won in Dubai for the second time this year. Hopefully tomorrow if everything goes right I can win here for the second time again. It would mean a lot. That's the reason I added this tournament to my schedule. "I originally wasn't going to play because, you know, five weeks is a lot of golf but I thought I play so well here, I love the place, I'm playing well, there's no reason not to go. So it's, for the most part or at least for now that decision has paid off."